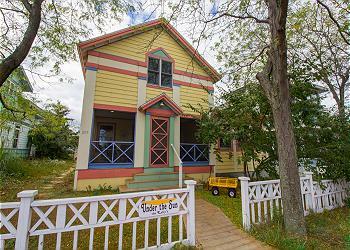 When you first drive up to the house you will notice the white picket fence and sunny exterior colors. 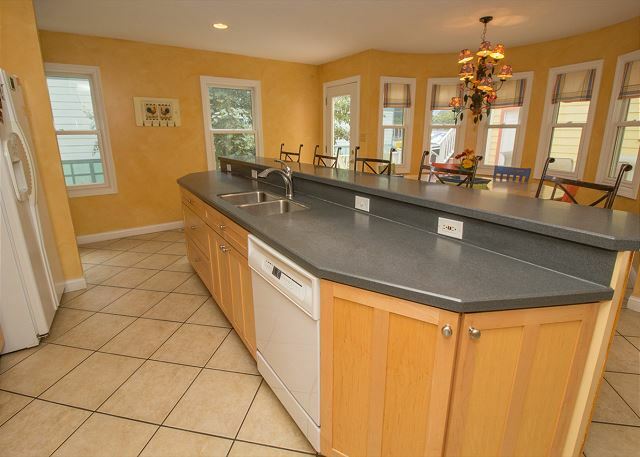 Walk into the home and you will be met by double height ceilings and a massive stone fireplace. Under the Sun offers four bedrooms and four bathrooms. The upstairs Master bedroom has a king sized bed with an additional single day bed. The downstairs have the following bed configurations; #2 (the red room) has a queen sized bed, #3 (the yellow room) has two single beds and a trundle, and #4 (the blue room) has two single beds and a trundle. The main house will easily accommodate (10) people. 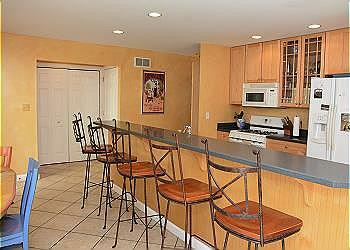 The kitchen has a long island perfect for setting up buffet meals and overflow seating. The kitchen table will seat 8. The kitchen is fully furnished so if you are interested in cooking meals, everything you need to prepare a meal is there. We offer extras such as blender, waffle maker, crock pot and an electric griddle. All linens and towels are supplied. 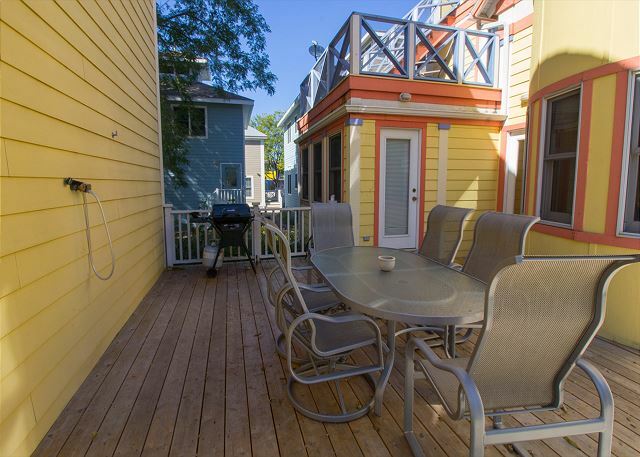 Enjoy the outdoors on the back deck or the front screen porch. 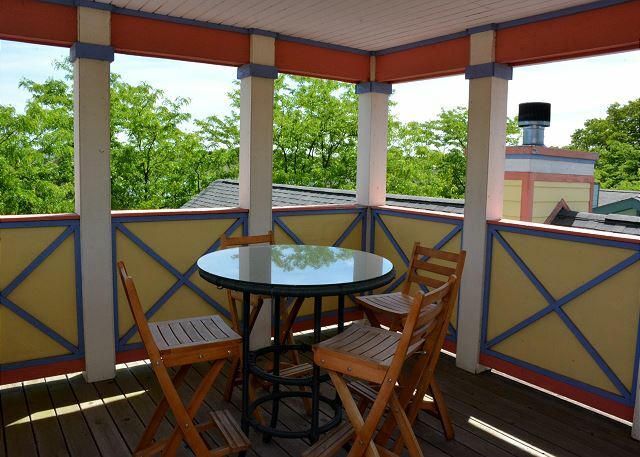 Under the Sun is centrally located across the street from the swimming pool and a short walk to Sandcastle Park or Lake Michigan. Make sure to check out the coach house "Over The Moon" which can accommodate 6 more guests should you need the additional space. IN THE LATE FALL, WINTER AND EARLY SPRING, UNDER THE SUN BECOMES SCRAPPIN FUN UNDER THE SUN! Experience a relaxing weekend getaway where you can work on your favorite craft with no distractions. Whether it is scrapping, quilting, stamping or beading, Scrapping Fun, Under the Sun will provide you with all the comforts of home. We are a mid- west retreat conveniently located in Michigan City, Indiana just 60 miles from Chicago. Our home is located in a beautiful, unique community called Beachwalk Resort. 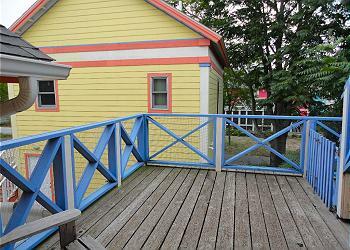 Here you will find colorful cottages that line the streets. Lake Michigan is an easy stroll from our front door, with shopping, restaurants, casino's and grocery stores just minutes away. Scrapping Fun, Under the Sun, a self-service retreat. What we mean by that, is there will be no on site hostess. The weekend is on your terms, on your schedule. 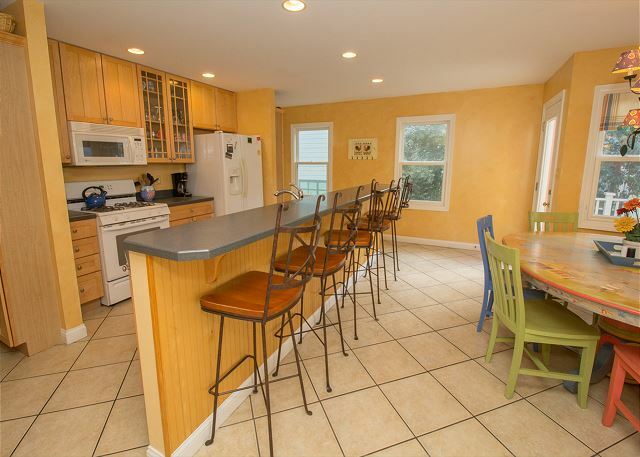 You can dine out or make your meals in our fully functional kitchen. Catered meals can be arranged for you if you do not want to spend any time in the kitchen. Although you will not have an on site hostess, the Beachwalk office staff will be there to assist you with your keys and any other questions that you may have concerning the house or the area. We had our 3rd scrapbooking get-away at Under the Sun, and it was fantastic as always. The location is perfect, and the house suits our needs perfectly. We can't wait for our next visit! We've rented Under The Sun now over 10 years for our scrapbooking and card-making weekend crop. UTS is very clean, warm and welcoming. 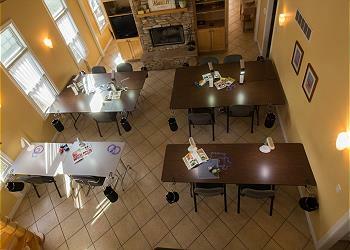 Tables with Ott lights and cup holder w/trash bag already set in place. There is also a Cricut w/cartridges and plenty of punches and CM's custom cutting system. We all had a fun and relaxing time and plenty of good memories! We had a fantastic experience again at Under the Sun and Over the Moon (we rented both). 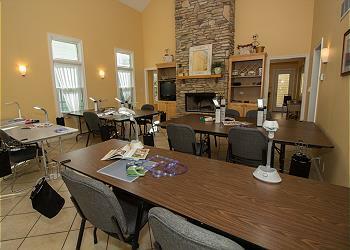 This is our second time staying for a scrapbooking retreat, and the space and environment was great for our event. The property was neat, the location perfect, and it made for a great weekend. The owner of the house is incredibly friendly and accommodating. The house is set up for scrapbooking in the off-season with tables, comfortable chairs, and table lights as well as scrapbooking tools which is super helpful. The only down-side is that the beds aren't super comfortable other than the king upstairs. We could also use a bit more light in the main scrapbooking room, maybe some lamps. However, for the price, location, and all the other amenities, it is definitely a great value. Our group of 12 had a wonderful time at Under The Sun and Over The Moon. Such a cheerful place to stay. The weather was nice enough to take advantage of walking around Beachwalk and hitting the outlet mall on the way home. We love having your group and look forward to seeing you again soon! We had a fantastic time here for a weekend winter scrapbook retreat. We had the fireplace going inside, but also enjoyed walks to the lake to see the ice shelves. It was only a couple blocks to the boardwalk that led down to the lake. The house itself had a great kitchen area for us, and a fantastic set-up for scrap booking. It was a little tricky with all the taller girls in our group and having mostly twin beds in the house, but we made it work. We already plan on going back 2 times next year instead of just the 1 weekend. Beachwalk took great care of us and helped us get shoveled out at the end of our weekend. Looking forward to next year! Under the Sun was spacious, pleasant and had everything we needed to prepare meals for our large family. 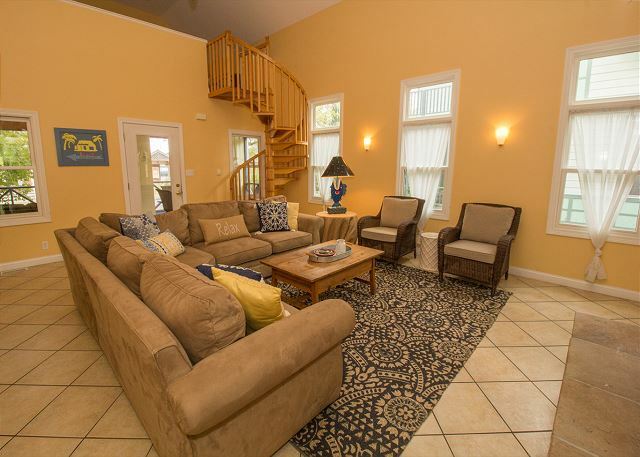 The location was convenient to the pool, playgrounds and beach. We will definitely return for future vacations. Our stay was very nice. Everyone had a good time. Love the option of going to the pool--especially with the little kids. And parks were a bonus for the kids. Everyone seems to be in a good mood & the atmosphere is very relaxing & pleasant. We are thrilled you had a great time and hope to have you back! Never hesitate to contact us, we would have been happy to come remove your garbage and even clean out the cans. All feedback is appreciated and helps us improve our services, thank you for taking the time to write a review! Our second visit to this property -- actually, cleaner than last year, appreciated the new decking and front walkway. Always nice to see improvements. Would definitely stay again. We thoroughly enjoyed our stay at "Under the Sun". 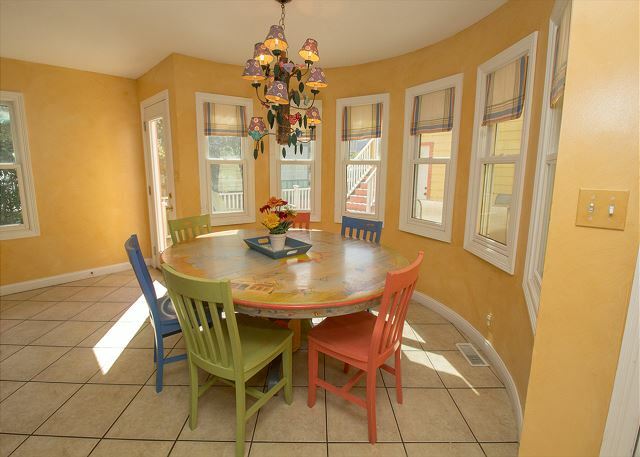 The house was well-maintained, spacious and perfect for our needs. It was very convenient to have the pool across the street where the children spent a lot of time. We would definitely rent the house again. As always, we had a fabulous time scrapbooking at Under the Sun. Wonderful accommodations for scrapbooking. Everything setup for scrapbooking and plenty of scrapbooking supplies already there, even a Cricut machine with plenty of cartridges! A vacation to remember, and revisit! it was just delightful! The home was immaculate, and well stocked with luxurious towels. The kitchen and home had all the amenities anyone could ever need. I will recommend your Under the Sun home to anyone! Beachwalk is a relaxing and fun place to vacation. However, the HOA needs to do a better job of up keep and many of the homes are not being kept up the way they should. 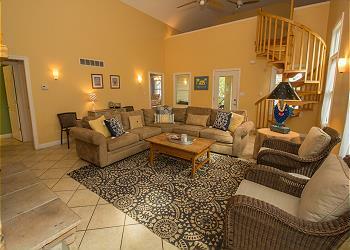 Under the Sun is in an excellent location (across from pool) and has a wonderful floor plan. However, it needs to be updated. Also many items need repair i.e. fans, dishwasher, TV, lamps etc. 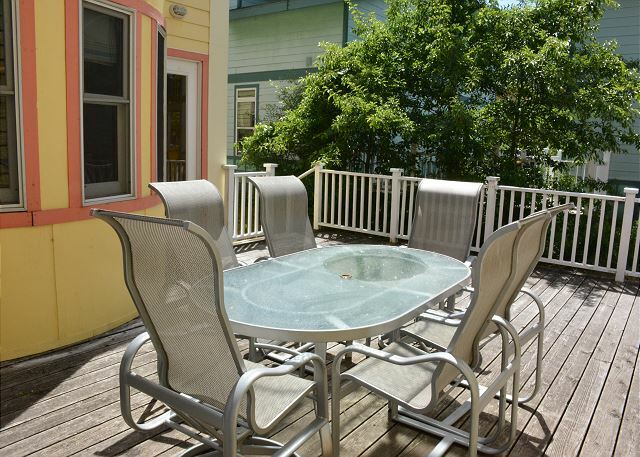 Deck needs to be repaired and refinished. Would recommend if owner does the necessary update/ repairs. We had a great time during our stay at Beachside. My son and his family from Tacoma, my daughter and her family from Chicago, another daughter and her son from Wheaton and my husband and I had real time together as a family. We had plenty of room to reconnect with one another in a leisurely way without the hustle and bustle of holiday time. After a horrific year of a grave health issue in our family, we were blessed to rejoice in the renewed good health of our patient as well as the birth of a new baby girl for our growing family. My gaggle of girls, laughed, sang, cooked with their grammy, played on the beach, swam in the lake and the pool and just loved being together. Everyday we packed our lunch and off to the lake we went. The one day of all day rain, we went to the movies and then did jigsaw puzzles with their Papa. All of my children and their spouses work very hard during the year. It was such a joy to not be on a schedule other than our own. My grandchildren are ages 15 down to 2 months old, and Beachside worked for each age. Even the new baby went to the beach in a tent for a bit each day. I came home, relaxed and grateful that we could all be just ourselves together. We are deciding which week is best for us next year, because we will certainly be back. Loved this house. We stay at a different house each year, and this one was my favorite. Perfect location across from the pool and great outdoor space. House was clean and had everything we needed. We might book again for next year! Under the Sun; Amazing week!!! Everything awesome minus 1 thing; I wish someone would have take a weed-wacker to the side yard. All else was just great. 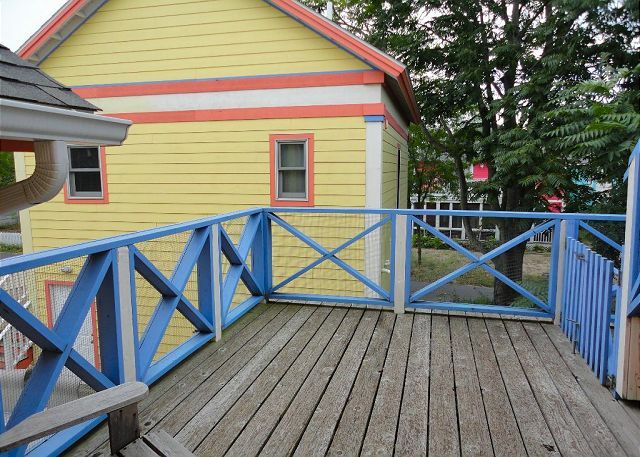 Loved the location -- close to office, pool, the Beach Hut, playground, beach. Home was clean, except (strangely) the tile floor was filthy -- I mean ruin-the-little-ones'-socks filthy. We scrubbed it with a bucket and mop provided. (Too much work for vacation!) Also, the coffee maker leaked badly -- had to keep a mug under the spout while brewing and transfer to a carafe. Still, overall a very good experience. Great experience everything went well, the house was amazing people friendly and weather perfect. Looking forward to another trip to Michigan City Beachwalk. Our trip was wonderful. The rental was superb and very clean... it is right across from the pool. We hope to stay there again sometime.